The newly re-configured Weston Athletic Complex opened in the fall of 2014, and is home to Eph football, track and field, lacrosse, and field hockey teams, while also providing practice and game fields for the soccer teams in case of unplayable field conditions at Cole Field. The complex consists of two separate turf fields, Farley-Lamb Field (long turf) for football and lacrosse, and Williamson Field (short turf) for field hockey. Both fields and the track are lighted to allow for night practices and games. The Eph track and field team races and practices on the eight-lane Lee Track, which encircles Williamson Field. Jumping pits are alongside Williamson Field and at the end of the field. The surrounding field areas are used for field events. A team support building, located at the south end of Farley-Lamb Field provides all of the teams with countless resources. The building contains four sizable home locker rooms, two for men, and two for women, in addition to separate locker rooms for coaches. The Ephs also have access to a training room complete with an examination room, a hydrotherapy room, and a taping room. On the second floor, the teams enjoy a spacious multipurpose room. Teams can use the filming deck to film games or practices from a behind-the-goal line view. The building also contains offices for coaches, a laundry room, and a massive storage area for equipment. There are viewing decks on both sides of the building for spectators. This complex gives Williams' athletes sports facilities that are among the best in NCAA Division III. and it was completed in September, 2014. WATCH VIDEO "A New Weston"
In the fall of 1998, Williams formally dedicated the Carol Girard and Cynthia Stewart Simon Squash Center, thanks to the vision and generosity of Williams alum and former squash captain, William E. Simon, Jr. '73. Boasting twelve cement-plaster courts (nine of them glass-backed), brand new coaches' offices, and the state-of-the-art Henze Fitness Center, all set like a magnificent jewel right in the center of campus, Williams College proudly offers its players the finest squash facility in the country. The Torrence M. Hunt '44 Tennis Courts feature 18 hard courts, six of which are the premier competition courts for home matches. These six courts feature fan seating, a team-friendly layout, and the Chaffee Tennis House. Built in 1997, the Chaffee Tennis House overlooks the six competition courts and features locker rooms, a team room, and a viewing deck. The Hunt Tennis Courts have served as host to the NCAA Championship Regional Rounds each May starting in 2008. They have also been the host courts for the ITA Regional Tournament and the NESCAC Championships on both the men’s and women’s sides. In addition to the outdoor courts, the Lansing Chapman Rink houses four indoor courts, giving Williams Tennis unsurpassed facilities. The Bennington Tennis Center and Herbert Towne Field House offer Eph athletes two other indoor venues for year-round training. Par 71 – Yardage - Black 6,808 yds. Gold 6,410 yds. Purple 5,828 yds. White 5,143 yds. The home of the Williams golf teams is the Taconic Golf Club, located just south of the newly re-configured Weston Field Athletic Complex. Taconic is usually ranked #1 or #2 on Golf Week's list of Best Campus Golf Courses in the U.S. each year. The eighteen hole, par 71 course also has excellent practice facilities on site, including a putting green, a practice bunker and wedge area, and golf nets. Additionally, the Club provides its members and Eph golfers with a driving range at nearby Cole Field. Lasell Gymnasium provides the golf team with indoor facilities, which include three indoor hitting areas. The team frequently uses advanced video equipment indoors to analyze and improve swing technique. The nearby Waubeeka Golf Links makes its brand new driving range and practice green available to the Williams golf teams. Williams continues its commitment to providing quality-training facilities close to campus with both Nordic at Prospect Mt. (Woodford, VT) and Alpine training sites located at nearby and Jiminy Peak (Hancock, MA) ski areas. Jiminy Peak is presently the main training site for the Alpine team. The skiers take advantage of a quad chair lift servicing the race slopes, and also have the benefit of Jiminy's fine snowmaking facilities on one of the best slalom and giant slalom hills on the carnival circuit. The team also uses nearby Stratton Mt. and Mt. Snow to augment its GS training. The Nordic team trains and races at Prospect Mt. Ski Touring Center on trails groomed to racing condition daily. Jiminy and Prospect provide easily accessible training sites and allow the Ephs to host Williams' highly popular and competitive Winter Carnival. Slalom and giant slalom events are conducted at Jiminy Peak, while the 10K and 15K cross-country races are held at Prospect Mountain. Just past the tennis courts to the north is Cole Field House, where Ephs teams and opponents dress for intercollegiate contests down below on Cole Field. A complete overhaul of Cole Field House was recently completed. Both the men's and women's teams take advantage of the locker rooms, meeting rooms, equipment rooms, and the trainer's room within Cole Field House. Williams College possesses one of the best soccer facilities in the country, as the fields are impeccably manicured grass surfaces situated in a beautiful locale surrounded by the Berkshire Hills. The men's and women's game fields are located side by side and are 120 yards long by 80 yards wide. Both fields are used exclusively for matches. Williams has three other regulation soccer fields for practices and JV games. There are numerous spaces used for grids, pendulum balls, and a kick board. Cole Field is also home to the Eph softball team. The field now can be counted among the best in any division in New England. Alongside the field are batting cages and pitching areas. The space occupied by the old football practice fields doubles as a driving range utilized by the golf team. In the fall of 2004 the Bobby Coombs Baseball Field was re-located from Weston Field on the south end of campus to Cole Field on the northern end of the campus. The re-located Bobby Coombs Field is one of the finest collegiate fields in the northeast with a permanent outdoor fence, crushed macadam warning track, dugouts, and an extensive drainage system in a setting that is close to idyllic. The dimensions of Coombs Field are 330 ft. down the foul lines, 375 ft. to the power alleys, and 400 ft. to dead center. The home of the Eph basketball and volleyball teams is John Wesley Chandler Gymnasium. Chandler Athletic Center also houses coaches' offices for most of the Eph varsity teams and the Samuelson-Muir Pool. The Al Shaw Basketball Coaches Offices for men's and women's basketball overlooks Spring Street and provides a team-meeting and video-viewing area. 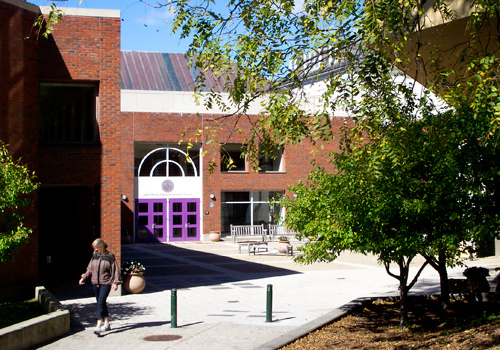 Located in the heart of the Williams campus and the center of Williamstown, the John Wesley Chandler Athletic Center was recognized in 1991 as a Facility of Merit by Athletic Business magazine for the way it connects existing Williams athletic facilities and adds to the business district in "the Village Beautiful." Named after the 12th president of Williams, John Wesley Chandler, the Chandler Athletic Center connects Lasell Gymnasium, the Simon Squash Center, the fitness center, crew tanks, Lansing Chapman Rink and Towne Field House into a true athletic mega-plex. The gymnasium in Chandler can accommodate 1,600 people for basketball games, in addition to the standing-room-only areas that fill up for NCAA tournament games and the annual clash with Amherst. The volleyball team plays and practices there as well. The gym floor is on the same level as the pool and the trainer's room, which provides the latest in sports medicine, rehabilitation, and injury prevention. In 1988, the pool in Chandler opened for competitive use and has played host to several New England Championships and three NCAA Division III Championship Meets. On May 20, 2000, the 50-meter (60-foot) wide pool was officially named The Carl R. Samuelson and Robert B. Muir Pool in honor of the two legendary Williams coaches. Muir and Samuelson coached a combined 62 years at Williams. In Muir's 30 years, the Ephs never had a losing season. Samuelson coached the next 32 years, highlighted by two NCAA Division III titles (1982 & 1983) and an amazing 11 years in a row of winning the men's and women's New England Championship in the same year. Samuelson-Muir Pool is an 8 lane 50 meter pool with a separate diving well that includes two 1-meter diving boards and two 3-meter diving boards. The pool contains two movable bulkheads that allow for a warm-up area in between the competition pool and the diving well. In addition, the Bob Muir Gallery offers seating for 400. Lansing Chapman Rink, home of the Ephs' ice hockey teams, seats 2,500, and has separate team rooms for the men's and women's teams and a trainer's room. The Lansing Chapman Rink surface is 200' X 85'. First used in September of 1970, the Herbert S. Towne Field House is a double-domed (technically a "hyperbolic paraboloid") structure that is 252 feet long and 152 feet wide. It contains a 195-yard Rekortan track, pole vaulting, long jump, and high jump pits, and shot put and weight throw area. In winter months, Towne Field House puts up four indoor tennis courts. Two batting cages and plenty of throwing space make the field house a suitable spot for baseball and softball practices in the off-season and pre-season. The spacious area inside the track, enclosed by netting also serves as an excellent practice facility for soccer, football, and lacrosse. In addition, the field house contains a rock-climbing wall. Lasell Gym, built in 1886, serves as a physical education area, and practice area for the JV basketball teams, and is the home of the Williams wrestling team. Lasell also contains an indoor running track, and three golf nets. A climate controlled wrestling room, contains two full mats that are cleaned daily. Wrestling matches are held in the gymnasium area of Lasell, which provides an unbeatable atmosphere. The Upper Lasell Fitness Center contains numerous elliptical trainers, stationary bikes and, treadmills as well as state-of-the-art weight machines. The Lower Lasell Fitness Center (LLFC) now houses weights and equipment used for strength development. One floor below LLFC is a rowing tank that both the men's and women's crew teams benefit from during the months they are not in competition. All of the locker rooms in Lasell have been updated with team rooms added for opponents.